I really would love to spend the money to get some stationary personalized, though I can't decide if I should just get my name/monogram or have it from the hubster too. Thoughts? What a great posting. I think so many people have went to use emails and facebook when thanking people, but I find it so much nicer and personable when I receive a hand written thank you. I still use the stationary my grandmother bought me years ago and love to send thank you notes as well as letter. Thank you for the wonderful posting. It makes me so sad to see how many don't even bother with a note anymore. They figure calling or an email are good enough. There's nothing better than an "old-school" thank you note!! I love your tips, those are so true! Jamie, I agree completely. I love sending AND getting notes in the mail! It just doesn't even compare to a call or email. Thanks for reading! I love having pretty stationary on hand, I am more excited to write a thank you note when I have something "pretty" to write it on. I have some that is personalized and some that is plain. Great tips, thanks for sharing! Great tips, though my handwriting is far from attractive. I do agree though that handwritten notes much more personal and meaningful than a simple email. It's tough to find the time sometimes to sit down and write out a note! You make an interesting point about the cultural differences. I didn't think about that! Is there something in India that people do to show appreciation, or does a simple "thank you" suffice? Thanks for sharing! I agree that a hand written note is nice in this world of technology that we live in. Thanks for the reminder! Absolutely. Such a personal and thoughtful gesture! Haha! We all know that feeling. Maybe try carrying small thank you notes in your purse with you. That way, if you're waiting for a doctor's appointment or find yourself early to a lunch date, you have what you need to get one or two written! Great things to keep in mind! I needed that last point. There were many time I didn't write a thank you note because I thought it was too late. I think writing a random thank you note like "thank you for being a great friend, husband, etc" to brighten someone's day is a tradition/habit I need to work on. Snail mail is more fun to give and receive than emails too. It's definitely more fun! And I know the feeling of feeling like it's too late - but I say do it anyway! The recipient will be just as appreciative. So...if I could only admit to you just HOW many times we failed to send out Thank You cards in the past...you'd probably throw a stack of blank ones at me. This one act says way more than just thanks, though. It screams out "I appreciate you so much that I took the time out to do something no one does these days - sit down and write!" An awesome reminder, thanks for this! Haha! I've had my share of slip-ups as well, so I'll cut you some slack and save you from awful paper cuts ;) And I completely agree that a handwritten note says more than a simple "thank you." I know when I receive one, I feel so special!! Your tip for "sooner rather than later" is so important! I know sometimes time slips away then I feel bad that 6 months has passed and feel lame even bothering anymore. Yes, it happens so easily, doesn't it? I know the person receiving the note though would be just as thrilled to get it no matter how much time has passed. My husband and I love hand-written notes and send them out for all gifts, dinner invitations, etc. Love it! I tend to be less mindful when sending invitations, but they're so much more fun. Thanks for the reminder! A great reminder. Thank you notes seem to have gone by the wayside with facebook, emails, texting, and other social avenues. I am a stickler for getting thank you notes out right away and have tried hard to impress upon my kids how important it is to express gratitude right away. When gifts are receive, we usually leave them on a table or dresser and will not even use them until the Thank you note has been sent. That may sound lame, but it has worked through the years and makes us get them done in a timely manner. Two weeks, max is my rule of thumb for sending out Thank you notes. Even after showers, write the note as you are putting the items away. I know there are circumstances that make that impossible, but it's just a guideline that I try to always go by. Thanks for sharing, I have been looking around the rest of your blog as well. You have a very nice blog. I love the idea of leaving the gift in site and untouched until a note is sent! What a great way to hold yourself (and kids) accountable. I may have to try that myself! And I appreciate the compliment on the blog. I hope you stick around! Unfortunately, I have gotten lazy. I was brought up to do exactly that, but have recently switched to the quicker, easier thank you email. But you are right. It's says so much more to send a hand written note, and this a good reminder. It goes the extra mile and expresses gratitude in a more personal way. Thank you for reminding me that old-school is sometimes the way to go! 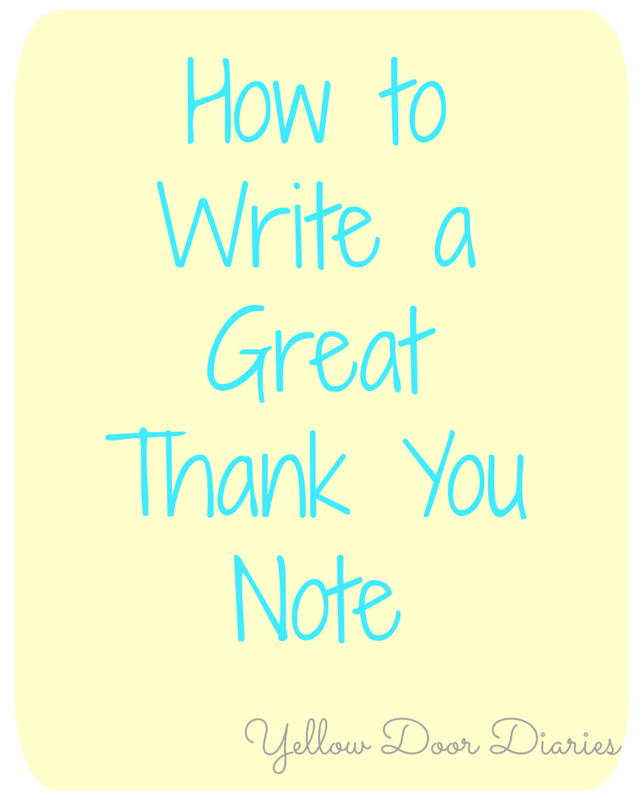 Great tips - I have tried hard to teach my kids to write thank you notes- my mother made me do it and now I pass it along. Grandparents especially love getting them! Definitely! My grandparents LOVE getting mail, especially thoughtful notes from their grands. Thanks for the reminder - I think I need to send them a card to send them some smiles! I am all about sending thank you notes. I think it's becoming a lost art. I've been to a few weddings and showers where I never received a thank you note and was kind of surprised. Thank you for the reminder that it's always a nice gesture to send a handwritten note. I try to get my teenage kids to do it, but it is a battle sometimes! They'd rather text or send an e-mail! People always appreciate a thank you note and a handwritten thank you note means so much! Even younger people enjoy receiving a thank you note. I make them feel appreciated and loved. Definitely! Everyone loves to get mail that isn't junk or a bill. Especially when it's handwritten and personalized! I feel like this is a dying art! Thanks for reminding folks about the basics. I think a handwritten note never goes out of style. Absolutely! I think all old-school manners are always "in." That includes thank you notes, holding doors for women and the elderly, and - at least here in the South - saying "sir" and "ma'am" to show respect! I absolutely agree with everything you posted. Every time my kids get gifts from their birthday or randomly we sit down and write out the notes. This is such a lost art. I love that you sit and do that with them! I think fostering that from an early age is a great way to ensure they'll continue the art, and to realize and appreciate the effort that goes into one they receive. Good for you!! That's awesome! I love that you're encouraging that habit. :) They will be grateful for that! Great tips! Definitely true on the timely. I ended up having my baby two weeks after my baby shower, and it took me forever to get those thank you cards out. By then memory was a thing that didn't exist anymore heh. I'm glad you found it helpful! The more you practice writing them, the easier they get. Awesome! Do you have any other tips you would share? This is such a lost art. I agree with you that they make such an impact. I think that being specific about how the gift will be used is the best part of receiving a Thank You note. Just knowing that what I did or gave was really beneficial or made someone's life easier or nicer is the whole reason I give gifts to begin with. Thanks for the great reinforcement! I agree! It's so nice to know that they're not only appreciative of receiving something, but that I got them a gift that is actually wanted and useful for them! I am so used to typing on the keyboard, that when it comes to handwriting anything, my penmanship has become a little sloppy. I used to send handwritten letters to long distance relatives or friends years ago, but I still do make an effort to send out handwritten thank you notes. I am always trying to get my children to write thank you notes. Eventually, they get to them but they are not always very timely. That's great! I think as long as they are writing them, the timeliness will come. The important thing is that you're just encouraging them to send them - most people might just be impressed they got one from a child at all! :) Good for you! Writing handwritten notes is still important, and in this age of texting and emailing, taking the time to send a heartfelt, handwritten note is still the best way to show our appreciation. My grandmother sent me a card or note every week, and they are precious keepsakes. Thanks for sharing these tips! I love that so much! What a collection of treasures you must have. Don't you just love seeing others' handwriting? It's so much more special! Thanks for the reminder, this is something I have fallen out of practice doing. I know how much I appreciate it when I receive a nice thank you note. Guess I need to do some stationary shopping! If you're looking for a job, a handwritten note after the interview can go a long way. It shows you are truly interested and have people skills. Even if you are not the right person for that job, they may have another job you would be right for, now or in the future, which a quick personal note could put you in line for. Managers get tons of email in the course of their work so yours can easily never be seen or be read so fast as to not evoke any reaction. Great point! I definitely agree that a handwritten thank you note after an interview really sets you apart (regardless of the outcome). Thanks for reading! A nice hand written thank you note is always well appreciated. It reinforces a personal connection and conveys the message that you care. Very sweet post. I completely agree. Nothing really says "thanks" like a kind, handwritten note! Thanks for reading - I'm glad you enjoyed it! Love this! I am BIG on thank you notes. I think it's such a nice and thoughtful thing to do, and it's easy! I don't think a lot of people in my age group (Millennials) really feel the same way, though. Let's bring them back, people! I agree, Jebbica! Let's make it a "thing" again. I hate that it's become so uncommon!! And thanks for the compliments on the blog :) Hope you stick around! One of my aunts was a whizz at thank you notes. The rest of the family always felt slightly shamed by the punctual arrival of her messages. I would love to say I have inherited her skill but sadly, no. I completely agree with the value of a thank you note and love receiving one, I am just depressingly bad at sending them. Your advice is great and has, hopefully, given me the nudge I need no only to improve my own habit but also to instil a similar habit in my boys. In a culture that is so tech savvy, I think Thank You Notes mean even more. These were great tips on writing them. We just moved, so I have lots of people to thank! Thanks for the tips! You're so welcome! I'm glad you found them helpful. I hope that the move went well and that you're settling in! My husband is all about writing thank you notes which has in turn made me do it so we always have an abundance of cute thank you cards on hand! I love writing thank you notes - or any note for that matter. Great tips! I'm glad you enjoyed them! Keep up the note writing. I know your family and friends love getting them! These are definitely things I apply when writing thank you notes! They're far more personal than an email or text message. So far any thank you note I've given was always appreciated. It's kind of funny when you get a "thank you" for a thank you note! It does remind me though that I have two thank you notes that are overdue. I'll have to get right on that! Thanks for sharing. I agree completely! And the "thank you" for the "thank you" can get a bit confusing hahaha. :) Good luck writing your notes and let me know if you have any other tips you'd like to share! My favourite thing to do is finding great thank you cards to add my personal message. it's seems a lot people don't do this anymore, but I love to send hand written thank you's in the mail. I think they make a difference. Thanks, Maggie! I agree. It's a lost art, but they make such a big difference, and send a big message. I know the people you send them to love receiving them! It seems that writing notes is becoming a lost art. Now that my son is old enough, I m teaching him to write thank you notes for birthday gifts he receives. Thanks for the reminder that a hand written note is a great way to make someone feel appreciated. That's great! I think that it's definitely important for parents to foster that habit in their children. Especially as we get older, thank you notes become increasingly appreciated! (ie. after a job interview, wedding gifts, etc.). Thanks for dropping in! I think the art of the personal, handwritten thank you has gone by the wayside. I was always taught to write them whenever I received a present. These days you barely get an email. Thanks for posting this. Thanks for the reminder. I always have good intentions that I'll get a thank you note off to someone, but then it gets forgotten or life gets in the way. I agree with others that it's becoming a lost art. So I need to be better at this. Thanks for sharing! I want to make sure my kids learn all these things! So important. Writing a good thank you note really leaves a lasting impression. I agree wholeheartedly. I think it's great you want to teach the importance of a kind note to your kiddos. They'll appreciate that skill for many, many years! I agree! I love picking out and sending gifts, and I just feel like my time and effort is much more appreciated when I receive a note (not that I get upset if I don't receive one, but it certainly is so appreciated!). I always write thank you cards. I admit my biggest failing is getting it done right away but I figure better late than never. I did try to do the generic picture thank you once but it just didn't feel right so I've gone back to handwritten ones. Great tips. I agree - better late than never! I think people certainly understand that life can get in the way of writing an immediate thank-you note. I think the fact that you always make the effort to do so is wonderful! Maybe cuz I'm a Canadian brought up by ex-hippie parents, but I almost feel that thank-you cards are often done in a "Pharisee" type of way - out of obligation, by people who look down on others for not writing them. They are useful for letting people know that you got their gift if it was at a big event where it may have slipped through the cracks and didn't actually get to its destination. I don't feel super appreciated when I get one . The most meaningful thank-yous I've experienced are ones verbally given when they were not obligated to give it - such as someone saying a week after the event "Thank you again for having us for dinner, it was a really nice evening, we had a good time...", or "That was the best shower gift, I've used it for years". Interesting! I've never thought of it that way, but can see that point-of-view. I just feel it's important to let others know you're grateful and appreciative of them, of any gesture or gift, and that it is communicated to them. Thank you for stopping by and taking the time to comment! There's always room for cultural differences, that's a great point. It's important to know the people and the situation when considering sending a note, and getting feedback from friends and colleagues who also know the situation is valuable. Thanks to you and your "fellow Canadian worker" for pointing that out!